It’s difficult to write summarily about a project that we’ve worked on for four years. As mentioned in Susan’s post, through working with these materials, we’ve lived with and thought about this organization and the people that built it for a long time now. 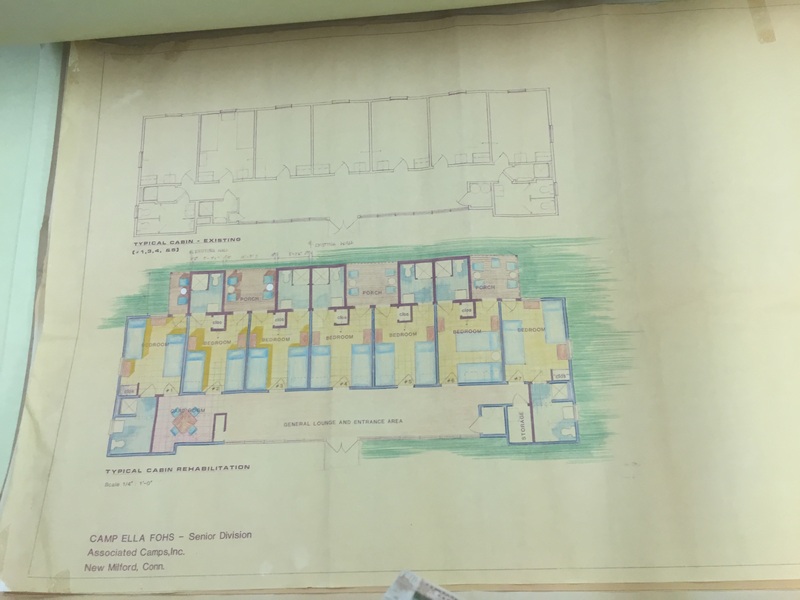 Below find an unofficial timeline of some of the highlights of the project, as we wrap up our work with the UJA-Federation of New York collection. Fall 2011: Project begins. The UJA-Federation of New York collection at this time contains over 3,200 bankers boxes of records from approximately 1909 to 2000 — in varying preservation condition– stored in the Citistorage warehouse in Brooklyn. Project staff includes Senior Archivist Susan Woodland, and AJHS Archivists Eric Fritzler, Marvin Rusinek, and Vital Zajka. What does it mean to “process” a collection? In short, it means to arrange and describe a set of records. Archivists arrange the records in a clear order (this could be chronological, alphabetical, according to the order the records were received, or in some other way that makes sense for the particular records), and then describe this order and the content of the records in a finding aid to make the collection accessible for researchers. 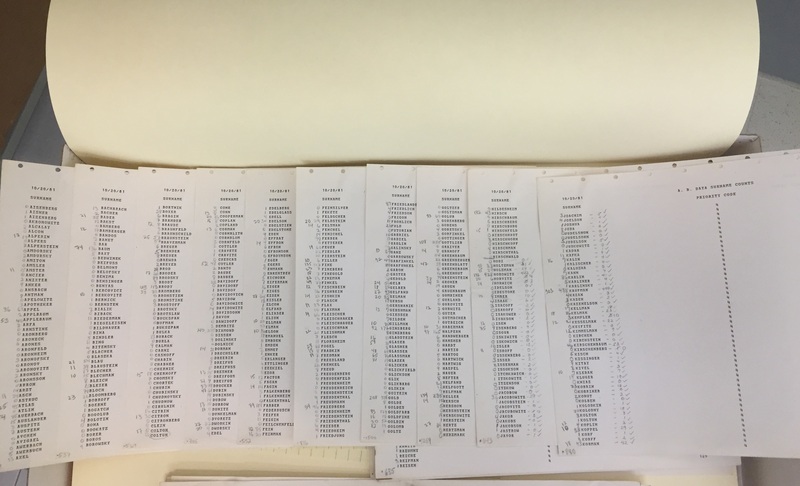 The first step of an archival processing project is, usually, to survey the collection (archivists look through boxes and any existing documentation about the boxes—such as folder lists). This helps archivists to get a sense of the records and the ways in which they might be arranged, and develop a processing plan. Due to the nature of this unusually large collection, the archival team had to develop a processing plan without looking through all the boxes, and instead familiarized themselves with UJA-Federation of New York organizational history through reading secondary sources (see our Selected Bibliography) to inform their processing decisions, and to utilize material found within the collection itself to better understand people’s roles within the organization and the structure of the organization itself. 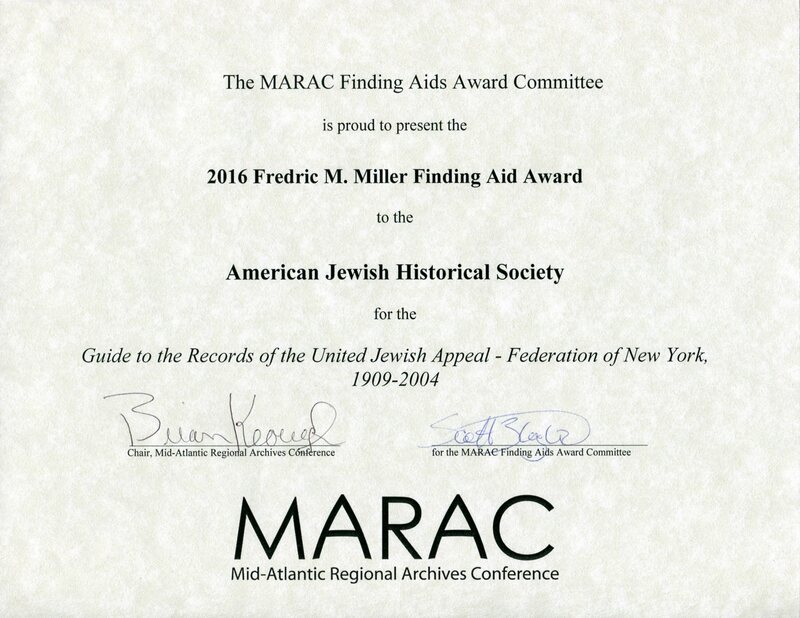 Processing initially began with the Oral History Project records, which we packed up at the UJA-Federation offices and worked with first, as this was a relatively small and distinct part of the collection. December 2011: The first boxes arrive from the Citistorage warehouse, and processing begins on the rest of the collection. 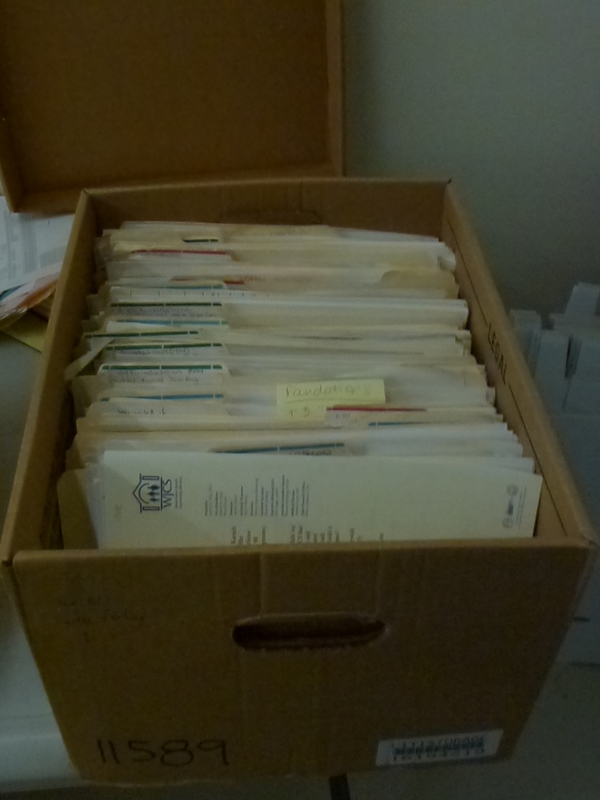 These boxes include some of the oldest records of the organization. 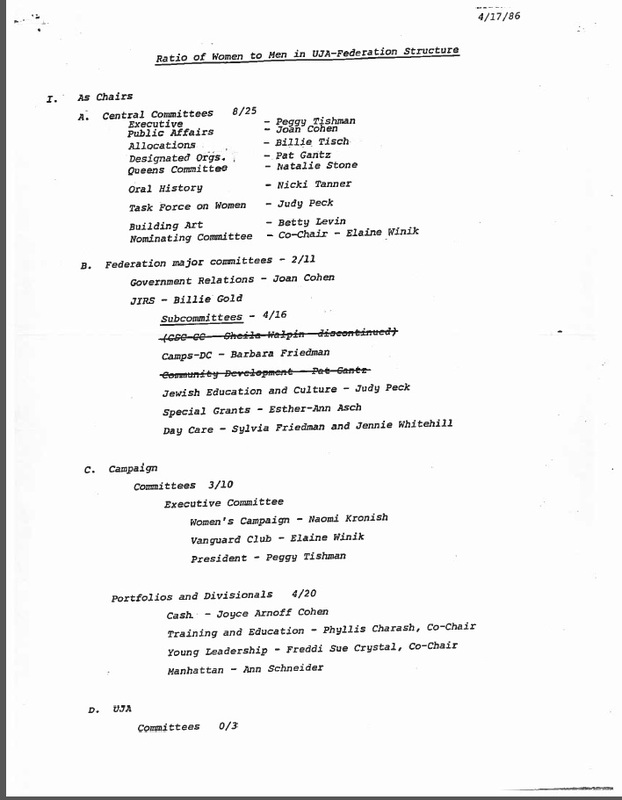 The collection is split into four chronological subgroups: Federation of Jewish Philanthropies (FJP) 1909-1986, United Jewish Appeal (UJA) 1938-1986, UJA-Federation Joint Campaign (UFJC) 1973-1986, and UJA-Federation of New York (UJF) 1986-2000. The fifth subgroup, composed of UJA-Federation’s Oral History Project, has already been processed. April 2013: Digitization of the Oral History Project is completed. May 2013: Heather Halliday, former Photograph and Reference Archivist at the American Jewish Historical Society, joins the project. December 2013: Processing of budget files from the Office of Management and Budget, the largest chunk of records in the collection (over 500 linear feet, or 5 football fields! ), is completed. These files contain annual agency files, Budget Department subject files, financial reports, agency financial reports, audited agency reports, Distribution Committee reports, functional committee reports, Greater New York Fund files, and Financial Experience of Affiliated Societies files. April 2014: Processing of UJF Executive Vice President files is completed. 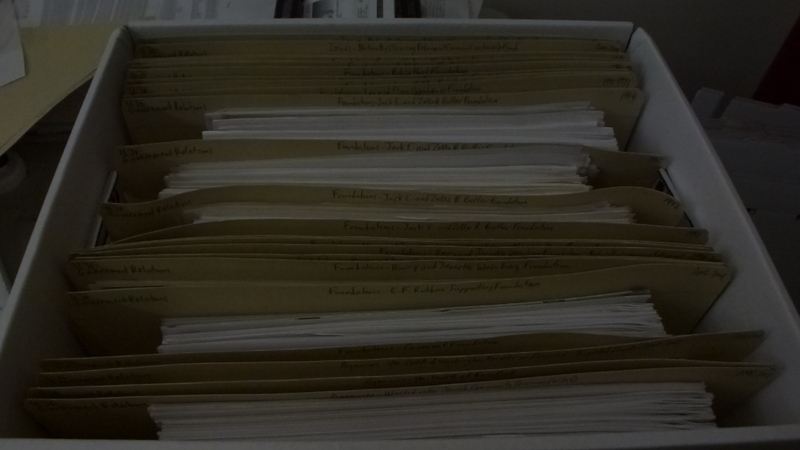 Over 167 linear feet, these files span UJF’s existence, from 1986-2000. 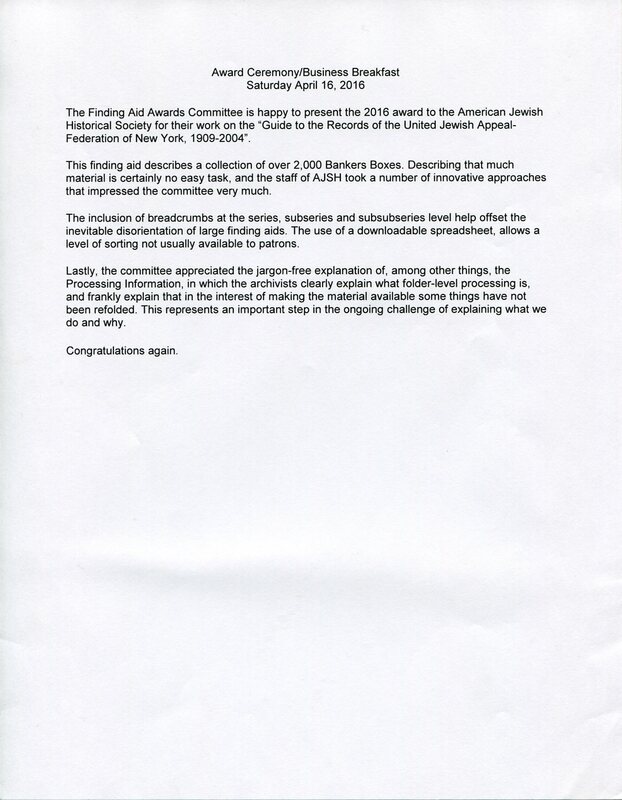 May 2014: Processing and digitization of Brooklyn Federation of Jewish Charities material, a precursor organization to FJP, is completed. 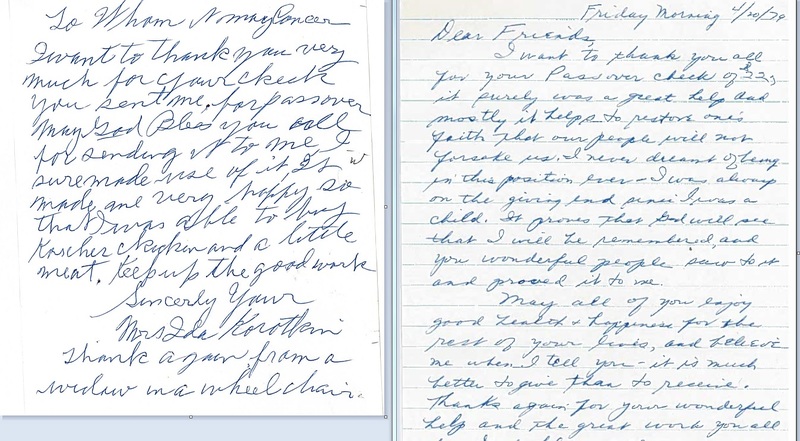 June 2014: A large selection of Board minutes from 1916-1992 are digitized. Sept 2014: A preliminary finding aid for the FJP subgroup is completed, and the over 500 boxes described in this section are now available to researchers. With the completion of the project, this finding aid will be replaced with the full collection finding aid. Oct 2014: Leah Edelman, newly minted archivist from the Simmons SLIS program, joins the project. Jan 2015: A fire in the Citistorage warehouse destroys 123 out of 305 boxes remaining in storage. Fortunately, over 90% of the collection had already been removed from the warehouse, and processed. June 2015: Nearly 500 images from the collection are digitized, dating from the 1910s through the 2000s. July 2015: An online interactive map of Federation agencies goes live. August 2015: With the completion of processing of oversize, artifact, and audiovisual materials (including the digitization of numerous sound recordings and films), processing of the UJA-Federation of New York collection is completed! The final box count is 2,021. September 2015: During this final month, project staff is wrapping up last (but not small!) tasks, such as the completion of the finding aid and container list. We say goodbye on October 2! 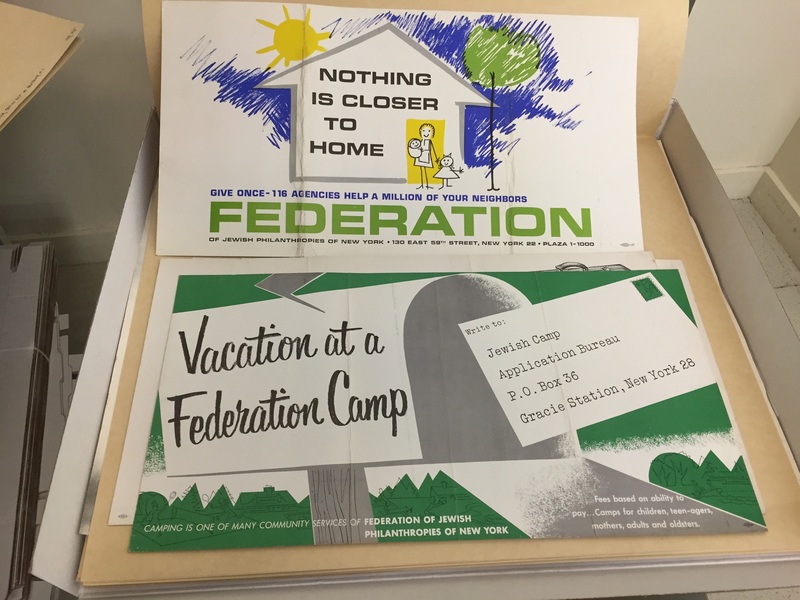 Finally, after 3 years and 10 months, the mammoth UJA-Federation of New York collection is completely processed. A photograph taken below shows the last box prior to being processed. The second photo depicts the refoldered folders in an acid-free bankers box. 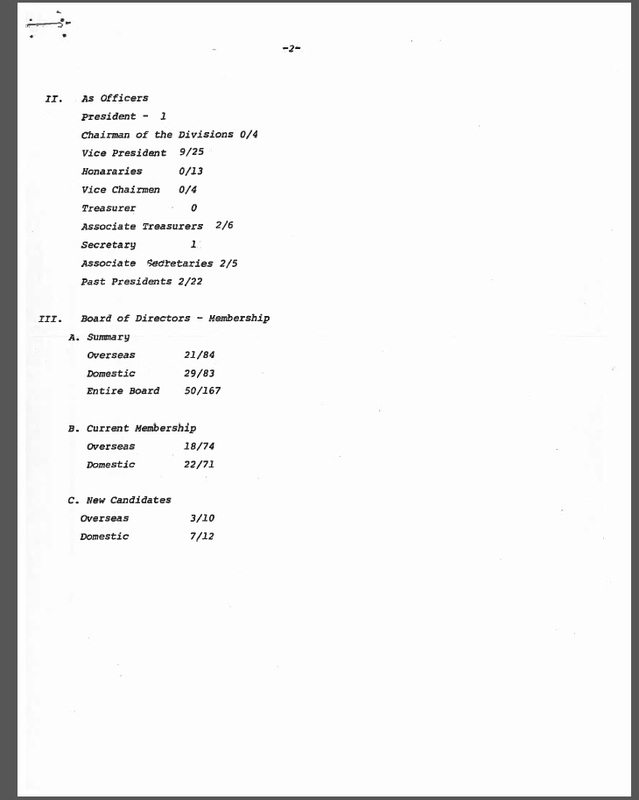 The last box contained the Government Relations files of Anita Altman, Director of Resource Management and Resource Development at Federation. The files in the box were a mixture of agency files, foundations, and issues pertaining to Naturally Occurring Retirement Communities (NORC). Having processed the collection for almost four years, I am immensely relieved and satisfied that the entire collection is now processed. By the end of September a finding aid to the entire collection will be posted online, easily accessible from the project’s webpage. Researchers will be able to view the searchable container list to the collection along with the online finding aid in order to request materials to view in the Center for Jewish History’s Reading Room. Links to materials and collections will be available through the container list and from the project webpage. We hope that researchers will find the collection of great value and easily accessible. We welcome and value your feedback. In reconciling our records of the 3232 boxes this project began with, we have been hoping that some of the boxes that could not be located in off-site storage when originally requested (and which had apparently not been lost in the fire) would turn up. Through the course of the project, on repeated requests for delivery, some of the missing boxes have been found and delivered. One box arrived on April 8th, and for a moment our heads returned not just to 2013 when we originally requested it, but to the late 1960s when many of the documents in the box were created. 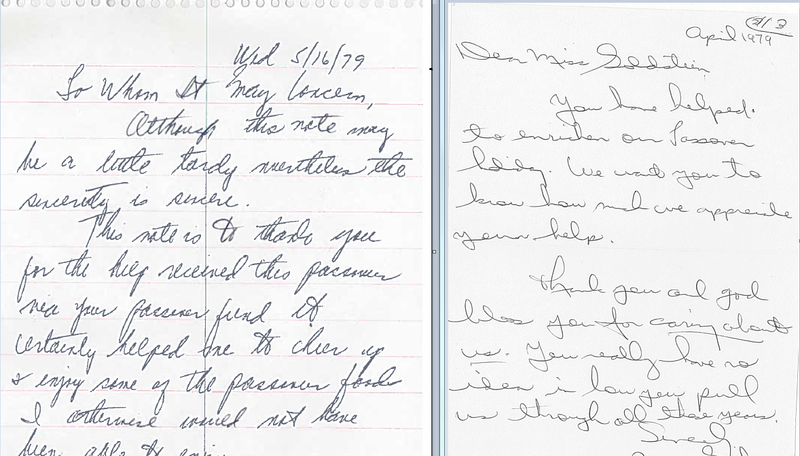 Eric described the contents when he went through the box as being half correspondence and subject files and the other half publications from outside organizations that Martha kept as part of her extensive subject files. 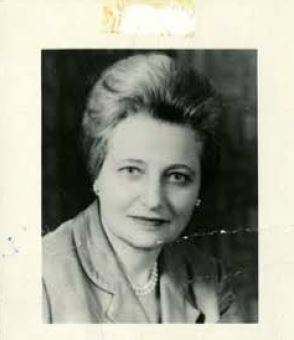 There are now 35 boxes of Martha Selig’s files in the collection, which will add enormously to an understanding of Federation’s work from 1946 to 1974, and primarily during the years of huge growth in the 1950s and 1960s. She was a committed leader in the Community Services division for several decades, and she controlled the budgeting and allocations as well as services to Federation’s agencies with a strong hand. 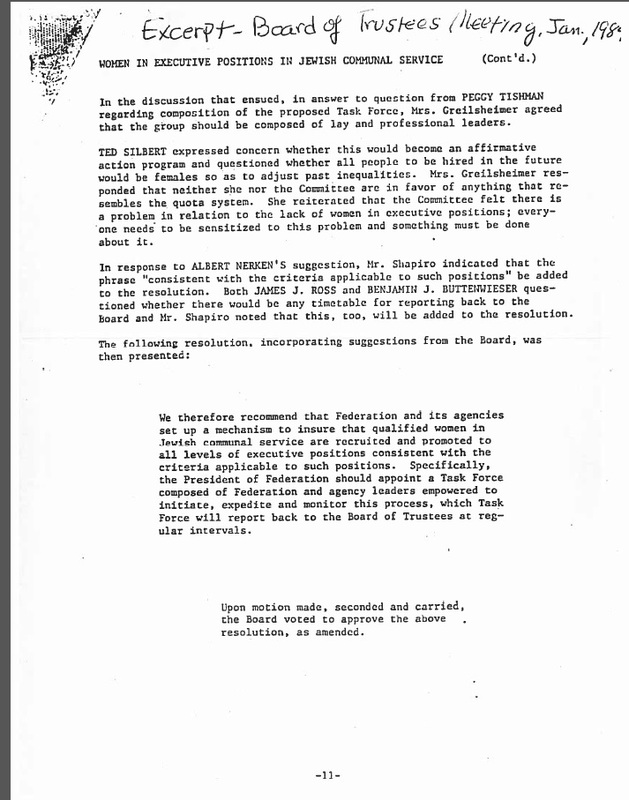 Together with Maurice Hexter and Joseph Willen, the co-Vice-Presidents of Federation 1942-1967, Selig was involved in every aspect of how Federation made it possible for each individual agency in their network to grow, offer expanded services to their clients, and move into new, modern facilities. Because all of Selig’s previously processed files have already been transferred to off-site storage, Eric has intellectually integrated these newly found files into the collection, and they will be housed physically in their own box. 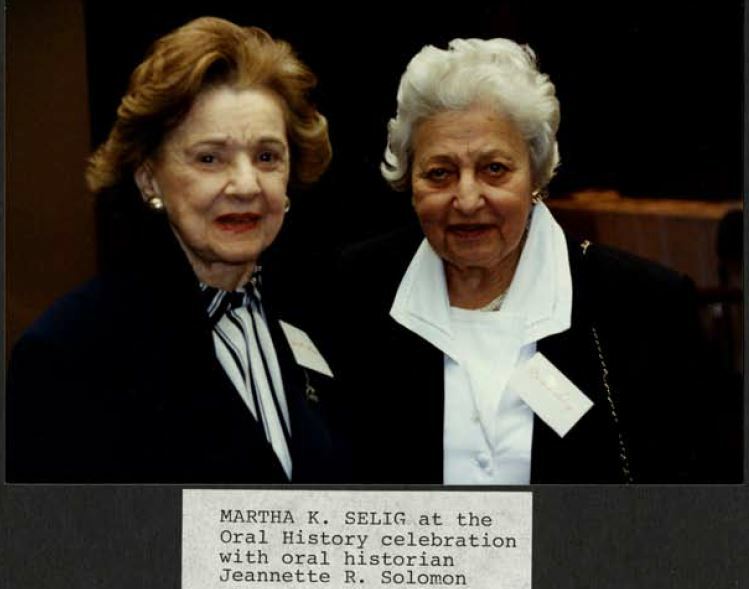 Martha Selig’s oral history, including a few photos of her, can be found here. Have you done your Passover shopping? Was it similar to this list– and these prices– from 1977? 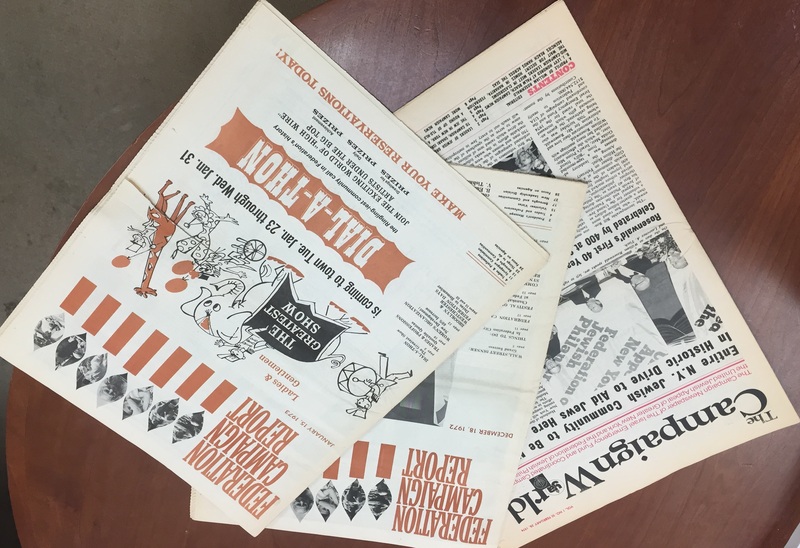 With the beginning of Passover tomorrow night, we wanted to share some materials from the collection about the Joint Passover Association (JPA), one of Federation’s agencies. Founded in 1927 with the purpose of coordinating Passover assistance activities and fundraising conducted by synagogues and Jewish organizations, the JPA provided Jews in need with funds to buy Passover items. By its 50th anniversary in 1977, the JPA provided aid to 4,065 applicants (11,263 individuals) and distributed $116,707 that year in relief funds. 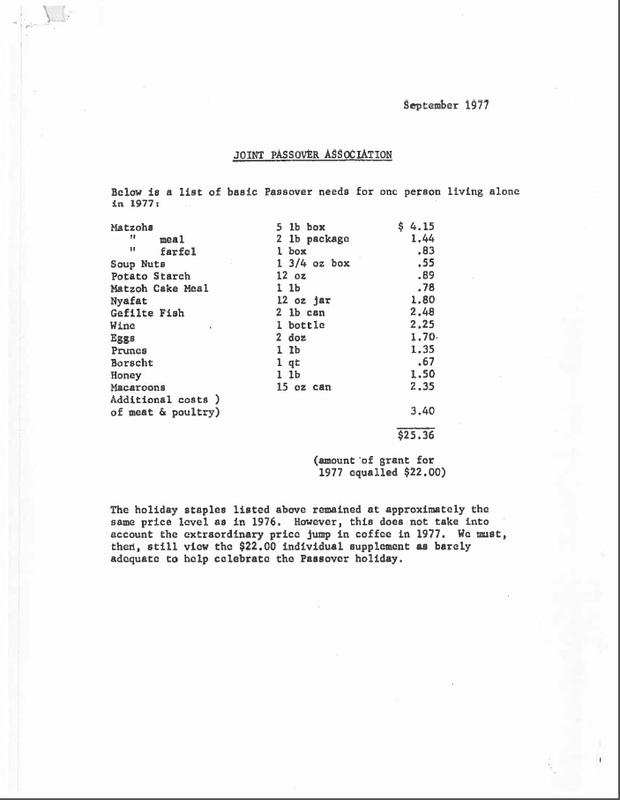 The above food list details the “basic Passover needs for one person” in 1977, and the prices reflect the amount of aid most people received. Though it may seem bare-bones compared to some lavish Seder spreads of today, most recipients were very grateful to receive help to celebrate the holiday. 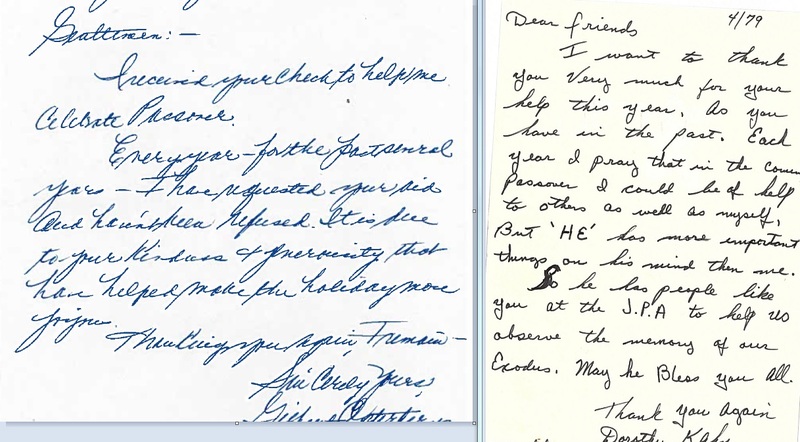 Below are a few of the many thank-you notes sent to Federation in response to receiving Passover assistance. The Joint Passover Association was a Federation-affiliated agency through 2009.